Even when Skarl was young, the future king of Meridell always had to have his food. He had toy soldiers that would march into his brother Hagan's model castle to steal his cookies. 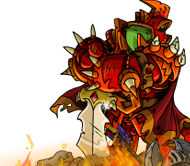 Help Hagan defend his castle against Skarl's toy invasion by using the clockwork siege towers that Hagan himself designed. You are about to send feedback on Biscuit Brigade: Hagan's Last Stand. We would appreciate it if you could give the game a rating out of 10, and also tell us any additional comments you may have. Thank you for your feedback on Biscuit Brigade: Hagan's Last Stand.